GAIL: Let's talk first about what you would do in the mines? What was your job? GEORGE: When I worked, I really didn't work a lot in the mines. Now all of my people did. My Dad's family and my Mother’s family all worked in the mines. In fact, my Grandfather Spiker was killed in the Shallmar Mines. GAIL: Could you tell us about that? GEORGE: I was not very old, but I remember it very well. He was working in a area where there was to be two people working at all times, and his buddy didn't come to work that day so they allowed him, he said I’ll just go ahead and work it on my own. He didn't come home that evening for supper and everyone was worried. Like I said, the Superintendent lived right next door to us. My Grandfather lived in the first house as you go into Shallmar. We lived next to where Mr. Bray lived, where Kenny Bray’s house was. They came up and ask my Dad about him not coming home from work. He went right down and asked the Superintendent. They went back to the mines, and my Dad started up over the hill to the mines, and the Superintendent had already gone in and found that a rock had fallen on him and crushed him to death. The thing that I can remember and always will remember is my aunt lived there, my Mother, and my Grandmother were all there screaming. I remember them all crying when they were told of the accident and that he'd been killed. That was a memory that I have too of the mining working days. They didn't have rescue squads and things like that. All they had was the man with a hearse. Whenever anybody was hurt bad, you'd see the hearse going up through town and up to the mines. Everybody always really was hysterical until they found out who had been hurt. Usually when they came in, somebody had been killed by a rock slide or something. It was really sad. I remember my Mother, she'd almost go crazy when she saw a hearse go up through town. It was really sad. GAIL: What was his name? GEORGE: His name was Elisha. How do you spell Elisha? That's a Bible name. GEORGE: Elisha Spiker. I think he was killed in 1936 or 1937. Social Security had just started, and he had contributed like a dollar and something to it and they refunded my Grandmother what he had contributed to Social Security. She didn’t get any Social Security from him. Never. That was something else too. There was workmen's comp., and she got workmen’s comp for so many years. Then, the rest of her life, she had no income at all. She stayed with us and did a little crocheting and knitting and housework for people. It was kind of sad. She got nothing. GAIL: What year was this you said? GEORGE: I think it was 1936 that he was killed. GAIL: And, she just missed out? GEORGE: Just missed it, yes. She said they had refunded the $1 or 2.50 Social Security that they had deducted from him in taxes. Mr. Bray was telling me one time that when they passed that law, he worked in the mines. In Elk Garden at the mines he worked at, the man that ran the mines just ranted and raved about it being the ruination of the country and they wouldn’t pay in to something like that. It was just ridiculous forcing people to pay that in. Kenny said he was the first person in this whole area to receive a check from Social Security. He became disabled and he got a disability check. The first one in the country to receive one and he had raised so much Cain about it when it first started. GAIL: Mr. Bray told you this? JACKIE: He wasn’t the one to raise Cain. GEORGE: Not Kenny Bray. The boss was the first one to complain but also the first to draw on it. audio - George Brady, Gail Herman. 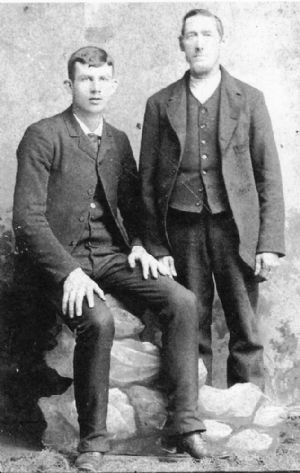 The photograph is of Elisha Spiker and his father-in-law Moses Beeman. Elisha's wife was Melissa Beeman Spiker. It was provided by George and Jackie Brady. The Annual Mining Report of the Bureau of Mines for 1937 reports Elisha's death. The full report is available at Frostburg State University Library. The pages that refer to Elisha Spiker's death can be read by clicking on the PDF.